The Irvine, California based D-Link is a leading manufacturer of networking, connectivity, and data communications products. Today, D-Link has a leading market share in the "Digital Home Connectivity" market segments. Its diverse product line ranges from wireless and ethernet based networking products to portable MP3 players. D-Link brings superior, cutting edge, technology at affordably pricing to both home and small office/home office end users. 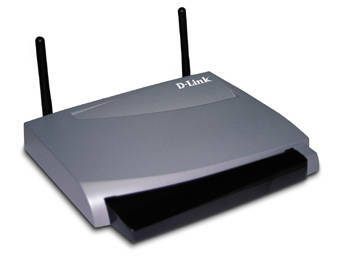 The D-Link DI-711 Wireless Router provides the ability to share a DSL or Cable Modem broadband internet connection through either a Ethernet network and/or Wireless 802.11b network. The DI-711 provides integrated router and firewall capabilities, along with NAT, DHCP, and packet filtering services. Safety and security features include port blocking, packet filtering, and natural firewall. Static IP address support, integrated DHCP client and host, PPPoE, and device name support allow the router to connect to nearly any DSL or Cable Modem broaband internet service, in addition to simplifying local network setup. The DI-711 offers two levels of security. First, its masks local users' IP addresses from others on the internet. Second, the DI-711 blocks all outgoing port traffic unless specifically set in the Virtual Server settings. Unlike proxy server or NAT software solutions, which require at least one computer be visible on the internet, no local computer connected through the DI-711 router are externally visible. Being a hardware solution, the DI-711 provides and "always on" shared broadband connection, removing the need to start up special software applications when you need to share. A built-in DHCP server allows up to 252 users to have their IP addressing set up automatically. Client machines require no software, or manually set IP addressing, only that the IP settings be set to DHCP. 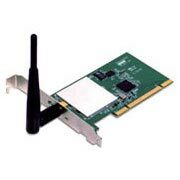 The D-Link DWL-520 PCI Wireless Adapter provides an integrated PCI solution that operates within the 2.4Ghz spread spectrum frequency range. It is fully compatible with 802.11b and Wi-Fi wireless standards. Alonf with the advanced wireless technology incorporated, the DWL-520 works with a wide range of PC motherboards by supporting the latest PCI 2.2 interface standard. The DWL-520 solution is suitable for both end users and network administrators looking for the convenience offered by a wireless connection. The DWL-520 can operate in both Ad-Hoc and Infrastructure modes. In Ad-Hoc mode, the card does not need a central access point and works on a peer-to-peer topology. In Infrastructure mode, the DWL-520 can be wirelessly connected to both wireless access points and to wireless broadband routers. The DWL-520 supports transmit speeds of 11Mbps, 5.5Mbps, 2Mbps, and 1Mbps. With a detachable antenna based on a reverse SMA connector, it is easy to upgrade to a enhanced antenna should the included one not provide proper data speeds. With a maximum indoor range of 230 feet and maximum outdoor range of 984 feet, the DWL-520 allows desktops to be placed or used in locations where a hard wired solution is not available. Now, let's take a look at the DI-711 specifications.